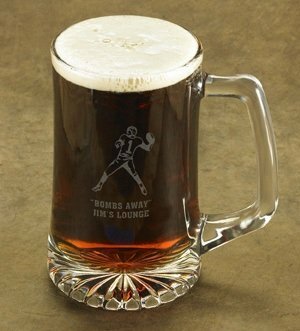 Toast your favorite pastime with our sturdy sports mugs! Each solid glass mug holds 25 ounces of liquid refreshment and includes your choice of a sports image plus two lines of personalization (up to 15 characters per line). Thank your coach, pay tribute to a winning team or celebrate a hole-in-one with one of these engraved keepsakes. This large, quality piece of glassware would also be a great groomsman gift.